Pinnacle State Park and Golf Course is a 714-acre (2.89 km2) state park located in Steuben County, New York. The park is southwest of the City of Corning in the Town of Addison, east of Village of Addison. Pinnacle State Park offers picnic tables, pavilions, food, fishing, a nine-hole golf course, hiking on 11 miles (18 km) of trails, hunting (deer, turkey, and small game when in season), and cross-country skiing. The first section of Great Eastern Trail in New York was marked at Pinnacle State Park in 2008. ^ a b "Pinnacle State Park and Golf Course". NYS Office of Parks, Recreation & Historic Preservation. Retrieved November 11, 2016. ^ a b "Section O: Environmental Conservation and Recreation, Table O-9". 2014 New York State Statistical Yearbook (PDF). The Nelson A. Rockefeller Institute of Government. 2014. p. 673. Archived from the original (PDF) on September 16, 2015. Retrieved March 12, 2016. ^ "State Park Annual Attendance Figures by Facility: Beginning 2003". Data.ny.gov. Retrieved November 11, 2016. 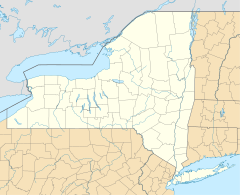 This article about a location in Steuben County, New York is a stub. You can help Wikipedia by expanding it. This page was last edited on 16 April 2018, at 20:52 (UTC).